The Tasmanian State Government and Forestry Tasmania regard special timbers production as a taxpayer-funded community service. Tasmania’s most valuable timbers are produced for the poor, the needy, and the deserving. Forestry Tasmania recently released their annual report for 2015, and it provides another wonderful opportunity to demonstrate the disaster that is public native forest management in Tasmania in the 21st century. But first an apology to readers. I have just become aware that I have been a victim of Forestry Tasmania’s special timbers obfuscations. Forestry Tasmania has an obligation and commitment to supply and report on “millable” special timbers sawlog production. But by including non-millable “outspec” and “craftwood” products in the reporting mix since 2008, they have created confusion and obfuscation to the point where “non-millable” products now dominate special timbers production and reporting. But FT has no obligation or commitment to produce or report on non-millable special timbers. Reporting on special timbers “millable” products is now at a minimum. Sustainable yield has become irrelevant. See below for details. Special timbers are mentioned in many places in the Annual Report with the main production discussed on pages 21-22. Once again there is absolutely no discussion of commercial matters. In 1991 with the Tasmanian Forests and Forest Industry Strategy, again in 1997 with the Tasmanian Regional Forestry Agreement (RFA), and again in 2010 with the Special Timbers Strategy Forestry Tasmania made the commitment to supply 12,500 cubic metres per year of millable special timbers sawlogs to the market (see Table below). This comprised 10,000 cubic metres of blackwood with the remainder being other species. That’s 25 years of commitment to supply and report on special timbers sawlog production. This commitment was given within the context of significant ongoing “sovereign risk” concerning access to and management of the public native forest resource. There has never been an obligation or commitment to supply or report on non-sawlog special timbers production. In addition in both 1999 and in 2013 Forestry Tasmania published sustainable yield estimates for blackwood sawlog production. This has significance as the only other sustainable yield calculation that FT produces is for native forest eucalypt sawlog. FT is therefore obliged to report against their repeated special timbers commitments and against the blackwood sawlog sustainable yield estimates. However you have to go all the way back to the 2007 Forestry Tasmania Annual Report to get a clear unambiguous report on the production of total special timbers “millable logs”. In that year there was a separate table showing non-millable (craftwood & outspec) production. This was the first time that non-millable production was ever mentioned in the annual report. Between 1995 and 2007 (12 years) Forestry Tasmania did not publish special timbers sawlog production by species. Only total production figures are available for this period. From 2008 onwards the reporting of special timbers production becomes increasingly obfuscated. From 2008 onwards it is unclear exactly what the actual sawlog production by species is, as non-sawlog (outspec and craftwood) becomes mixed into the reporting structure. The use of simple production tables and charts to show production by product and species, and hence demonstrate sustainability/profitability is completely absent. Instead FT uses charts to show production by species, but it is unclear whether these charts relate to combined millable and unmillable production, or just the millable production. By 2014 and 2015 however it is clear that the charts of production by species refer to the combined and not the millable sawlog production. [Never mind the fact that the 2015 chart (p. 22) shows “Area (hectares)” and not “Production (cubic metres)”]. These are experienced, professional people who know how to write reports. So much for commitment! So much for transparency! It’s a deliberate attempt to obscure the fact that millable special timbers sawlog production has plummeted, due to decades of overcutting of the resource and sovereign risk. See Chart below. Here is the table of special timbers millable sawlog production commitments made by Forestry Tasmania in 1991, 1997 and again in 2010, against which they have not reported since 1995. Annual supply targets for special timbers millable* logs for the ten-year period to 2019. * Millable logs include ‘Category 4’ sawlogs and ‘utility’ logs (Special Timbers Strategy 2010, p. 21). I have contacted FT in the hope of gaining some clarity around their special timbers millable log production data. Produce 11,300 cubic metres of special species timber [quality unspecified], and conduct at least 12 tenders for special species logs (2014 Sustainability Report p.56). That is an immediate breach of their commitment to produce 12,500 cubic metres per year of millable special timbers sawlog per year. During 2014/15, Forestry Tasmania produced a total of 11,042 cubic metres of special timbers from Permanent Timber Production Zone land. This comprised 5,051 cubic metres of millable logs, with the remainder being [non-millable] ‘out of specification’ sawlog and craftwood. Of the 11,042 cubic metres special timbers produced 3,744 cubic metres (34%) were “sold” through Island Specialty Timbers (IST). Of the 3,744 cubic metres “sold” through IST 220 cubic metres (2.0% and 5.9% respectively) were sold through the online tendering process to ensure that the best possible prices were obtained. 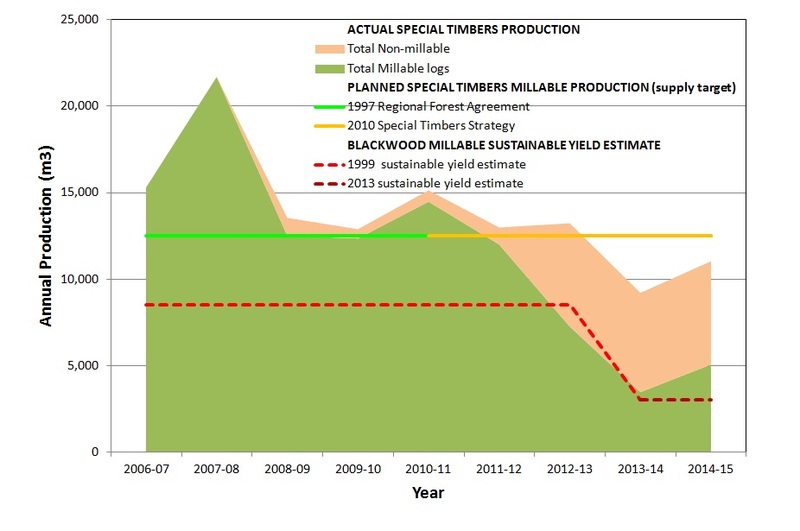 I created the chart below to clearly show what we currently know with certainty about special timbers production for the last 9 years from Tasmania’s public native forests. You won’t find a chart like this in any Forestry Tasmania publication. Over the last 3 years FT has collected a whopping 17,700 cubic metres of special timbers non-millable craftwood off the forest floor at taxpayers expense for which they have no supply obligation or commitment!! That’s equivalent to 900 truck loads. For the same period only 15,700 cubic metres of special timbers sawlog was produced. That’s 20,000 cubic metres of sawlog short of the supply commitment!! Most of the missing volume is blackwood sawlog. Why aren’t the alarm bells ringing?? Where is this vast volume of craftwood going? Who is buying it? What are the sawmillers/boatbuilders/furniture makers doing with no sawlog resource? Remember most of the special timbers story is about blackwood which makes up to 90% of annual production. So despite having a commitment to supply 10,000 cubic metres of blackwood sawlog per year, plus a sustainable yield estimate against which to demonstrate good forest management, we do not know with any certainly exactly how much blackwood sawlog has been harvested over the past 9 years. Instead the chart shows the final declining years of Tasmania’s special timbers industry, including our iconic blackwood industry. Blackwood timber could be grown by Tasmanian farmers if they were encouraged. Instead all we get is politics, conflict and wasted taxes. Only two other useful pieces of information are provided in the Report concerning special timbers production. One is that 216 cubic metres of Huon pine sawlogs and 128 cubic metres of Huon pine craftwood were recovered from West coast forests, rivers and beaches. No information is available on how much it cost Tasmanian taxpayers to have this timber brought to market. The [IST] tendering program received strong interest, with the highlight for the year being a 0.57 cubic metre blackheart sassafras log that sold for $3,815 per cubic metre. It’s curious because a) the Government has absolutely no interest in the real market value of its special timbers assets, and b) my records show that the IST highlight for the year was in fact a Tiger Myrtle log which sold at the April 2015 tender for $5,900 per cubic metre!! Curious!! Clearly the market is prepared to pay exceptional prices for quality Tasmanian timber. But forestry is not about business or profits. It’s a community service funded by taxpayers. Prices apparently are completely irrelevant. Finally after many years we get a clear statement of exactly how much taxpayers money is being wasted subsidising boat builders, furniture makers, guitar makers and Salamanca trinket makers. The community service obligations costs are set out on page 64-65 of the 2015 Annual Report. They total $6.87 million dollars of which $0.9 million dollars (13%) is used to fund special timber workers. That is a subsidy of $81.56 per cubic metre of special timber produced. In August 2014 the State Treasurer and the Minister for Resources directed Forestry Tasmania to provide the following community services. In undertaking these community service obligations Forestry Tasmania incurred net costs and was funded to the extent indicated below. Identify, manage and harvest special species timber and manage the Huon pine log stockpile (Annual Report p. 64). Tasmania is subsidizing wood that sells for hundreds to thousands of dollars per cubic metre in raw log form. Tasmanian blackwood timber retails for $7,500 per cubic metre, and Tasmanian taxpayers subsidise this!! Why? Can anyone please provide me with some logic here? That’s a $900,000 Tasmanian taxpayer subsidy so that the best possible prices are achieved on just 2.0% of the special timbers produced!! The deception is that any of this special timbers management and sales are logical let alone reasonable. Logic and reason, let alone profitable, sustainable forest management are completely absent. Our forest managers and our politicians are definitely playing us for fools. That this fiasco provides a sound moral, political, social and commercial basis for logging the Tasmanian Wilderness World Heritage Area is just offensive. That this fiasco is applying for Forest Stewardship Council (FSC) certification is just a joke. Forestry Tasmania is a million light years from good profitable, sustainable forest management. That this fiasco already has PEFC Australian Forestry Standard (AFS) certification makes a complete mockery of that particular certification system. My apologies for such a long blog but what can one do when faced with such a disaster. This entry was posted in Commentary, Forestry Tasmania, Politics, Prices and tagged Australian Forestry Standard, Blackwood furniture, blackwood industry, Forest Stewardship Council, PEFC. Bookmark the permalink. We are currently compiling information on special timber wood supply since the inception of the Special Timbers Strategy in 2010. This information will be published on our website and I hope it will provide the details you have asked for. This is being doe so that we can simultaneously satisfy a number of similar requests. We expect that this information will be compiled and uploaded by around mid November. I will let you know when we put it up. Given that these exact same supply commitments were made back in 1997 with the RFA, and even back to 1991 with the FFIS, I think FT owes the Tasmanian community and the ST community a bit more transparency and honesty than just data back to 2010. Gordon, as someone who has bought ‘outspec’ blackwood logs, I can assure you they are millable. There are 3 categories of blackwood sawlog: cat 4 (best grade), utility (below cat 4 but still good quality sawlogs) and ‘outspec’ (sawlogs that do not meet cat 4 or utility grade). Recovery from ‘outspec’ can be highly variable but well worth doing. In fact, they are often the logs that have a high degree of grain variation and patterns compared with straight grained cat 4 and utility sawlogs. I think your comments are based on a lack of knowledge of the resource. Hi Floyd, I find it curious that of all the significant issues I raise in my discussion you chose to focus on something I made no comment about. I made no comment about the millability of outspec logs. I was merely using the language used by FT who made a commitment 25 years ago to supply Cat 4 and Utility grade special timbers sawlogs. They have no such obligation to supply outspec or craftwood material. I’m sure you are right that there is plenty of good timber in outspec logs. But the commercial (as distinct from the custom) furniture industry wont survive on outspec material. And when will we turn to private growers to begin to rebuild the blackwood industry? Or will the blackwood industry go quietly into the night, and bequeath our blackwood heritage to the New Zealand farmers. Within the circumstances discussing the virtues of outspec logs seems a bit pedantic. So do you support taxpayers subsidising woodworkers at the expense of teachers and nurses? Gordon, I pay $200 – $500 a cube (occasionally more) for my logs. I’m confident that these prices are above production costs so no, I don’t believe I’m being subsidised at the expense of teachers or nurses. Hi Floyd, If you are buying from IST you are being subsidised whether you “believe” it or not. That $0.9 million of taxpayers money is for subsidising FTs ST operations. Everyone who buys ST from FT is subsidised. That’s the policy. That’s what the accounts say. Even the person who paid $5,900 per cubic metre for the tiger myrtle – subsidised! The policy says very clearly “special timbers are a taxpayer subsidised community service”. Now if you buy your logs from private growers that’s a different (and much better) story.